Hey everyone! I just felt compelled to tell you about my latest nail polish love! It's from Essence (a brand I find at Ulta) and the shade is "Date with the Night". Essence polishes are only 99 cents, however, they are a smaller size (.16 fl. oz.) And you know what? I have no problem with that. I don't often run out of nail polishes, and smaller, cheaper polishes are a great way to get some variety in my collection. I was drawn to this shade in the store because I think neutrals (light or dark) are just so easy to wear. You don't have to worry much about whether they're matching or clashing with something. I'd describe this color as a dark taupe... it's got a lot of grey in it, and (in the bottle) I notice just the slightest bit of brown. 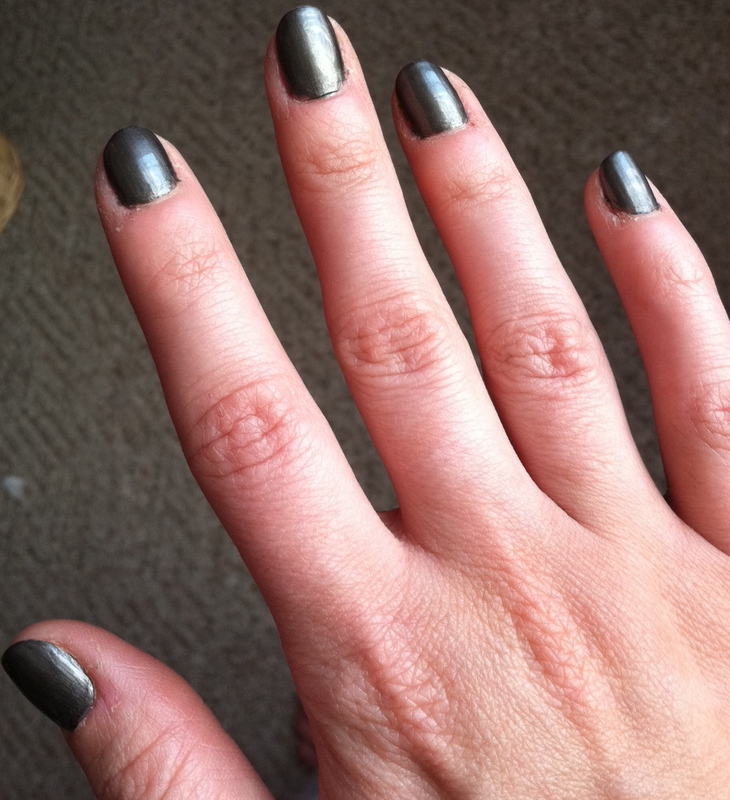 On the nails it comes off as more of a gunmetal shade... something that would look really pretty with the gunmetal-toned jewelry that's so popular. This color is a bit reflective on the nails, but not overly metallic. While this color does have the slightest bit of shimmer, it goes on the nails in a very opaque, creamy way. It wasn't sheer or streaky AT ALL. I could have stopped after one coat, but I had the time, so I opted for two, and then a clear top coat. Drying time wasn't exactly fast, but not an excessive wait either. This is the first Essence nail polish I've tried, and I know that all brands have their hits & misses with polishes, but this DEFINITELY makes me want to try more from Essence! :) The next test will be how long this lasts without chipping... I'll let you know in a future blog! What's your favorite kind of pizza? I'm loving thin crust ham & pineapple... got it from Domino's last night. I was at Kohl's yesterday and tried on a bunch of the new Jennifer Lopez brand. Didn't end up buying any of it, but I love the soft pink color she has worked in to the line. Several of the tops I tried were just really full and blousy and being as short-waisted as I am, I looked like I had no shape. Cupcake has been absolutely adorable lately. She made an appearance in my latest video. I did Zumba this afternoon on x-box Kinect. Forgot how fun that is!! Jep, wanted to add that, too. Essence is a German brand, and funnily enough the stuff is more expensive here than in the US. I love that color. I'm wearing one very similar. I absolutely love essence products they're so affordable and have a lot of great qualities items! I've got to try this nail polish! I picked this up this past week. Was the last one. Guess its a popular color! 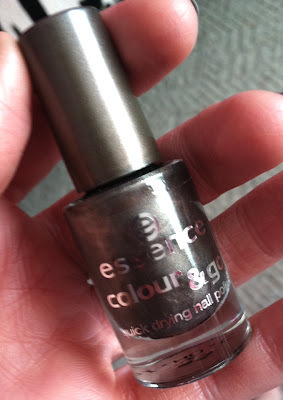 I have a lot of essence nail polishes, most of them are amazing! i Love "ultimate pink", ""irreplacable" and ALL their glitter polishes, you need to try them, they're amazing ^_^ and i loved to see cupcake on your video! I've heard a lot about this brand and I'd really like to try it. :) Thanks for the post! Mind checking out my blog and perhaps leaving a comment? I do reviews on beauty and fashion products. Thanks love! Hey Emily! I actually have that same color, however I haven't gotten a chance to use it yet. I have to say that I am quite surprised about the color as it does appear to be more of a brown in the bottle. It is such a beautiful color although, the Chanel Black Pearl definitely leans more on looking black than gunmetal. I love essence polishes though! Emily, you MUST try the single eyeshadows! Great pigmentation in most of them and amazing colors! You can actually find a limited amount of Essence products in Targets in Australia and I think some Myer's or DJ's in Melbourne at the moment. Essence has recently been introduced to Australia. I bought a lipgloss and eye primer. The eye primer was like $5 and actually pretty good. you really should try a lipstick from Essence, called 'all about cupcake'. The colour is an amazing, but not overwhelming pink, and what about the name.. I really love your videos, and however I'm having a very buzy schedule, I always watch and enjoy your videos. love the color.one of my choice. Unfortunately, they chip quite easily for me, so make sure to use a really good top coat. This brand is available in Australia too. In Priceline stores. I love that color. It's like giving your nails a diamond peel treatment.